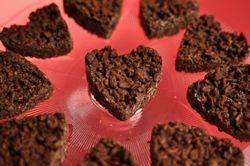 Chocolate Hearts: Butter, or spray with a non stick vegetable spray, an 8 inch (20 cm) square baking pan. Place the chocolate in a double boiler or in a heatproof bowl set over a saucepan of simmering water. Stir until melted then remove from heat. Gently stir in the Rice Krispies®cereal until evenly coated. Immediately pour the mixture into your prepared pan and lightly pat until even. Place in the refrigerator until set. Cut into squares, hearts, or other shapes. Can be stored in the refrigerator for several days.